Created by one of the Wadawurrung community members, Ammie, this piece is a representation of family violence in the past, the present, the future. The painting has been created to use as the artwork for this project’s online resource. The bottom circle represents our past. In our past our relationships, our self, our loved ones, our family may have been broken or come from broken. This is represented by the disconnected lines within the circle. The middle circle represents the present. In the present we may still be broken, we may be solid. Hopefully we are stronger than yesterday and ready for tomorrow. In the final circle we have solid lines. This is the circle of our future, the circle of tomorrow. We all deserve a solid future. The yellow banding, supporting all 3 circles, is a portrayal of all the services that are available to those in need. Services and Supports that aid in the healing from the past, to the present, to the future. Also binding the Circles is a representation of supportive people. These can be Individuals, Community, Family, Friends. Ammie is a Penangke Skin woman from the Arrernte people, Alice Springs, Northern Territory. Ammie’s dreaming comes from the Ntyarlke (Caterpillar). She was born and raised on Wadawurrung Country, Geelong Victoria and lives here still with her partner, a Bundjalung man, and their 6 young children. Ammie began painting in her early 20’s alongside her mother and mother in-law. Her works have been sold Australia wide. She has donated many pieces to raise money for cancer research, donations to provide sporting opportunities for young people and has worked within schools to teach children about her culture and art. Several sporting clubs have also had Ammie’s artworks on their guernseys for Reconciliation Rounds. 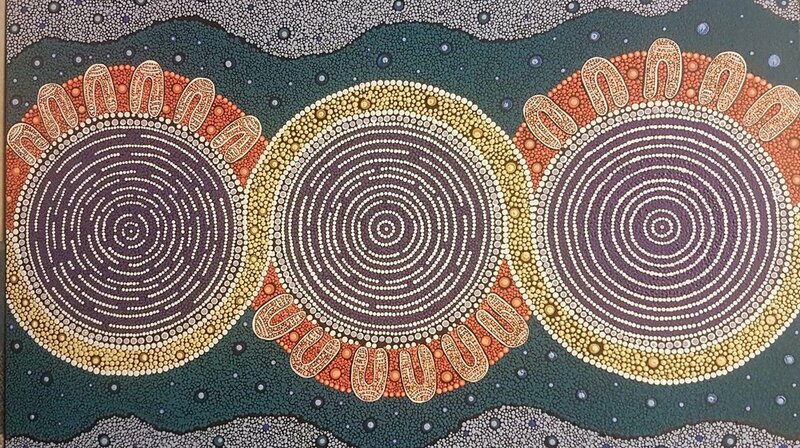 Ammie is a contemporary Aboriginal Artist who uses patterns, colour, shape and design to create paintings that portray a sense of country, culture and self.